What was once planned to be a condo building here at 111 Seaboard Avenue in the Seaboard Station area, will now be renovated for shops. This one-story building will be converted sometime this year, according to David Bracken at the N&O. What would you like to see in the new spaces? And can we make it easier to cross Peace Street at Vaughn Street? 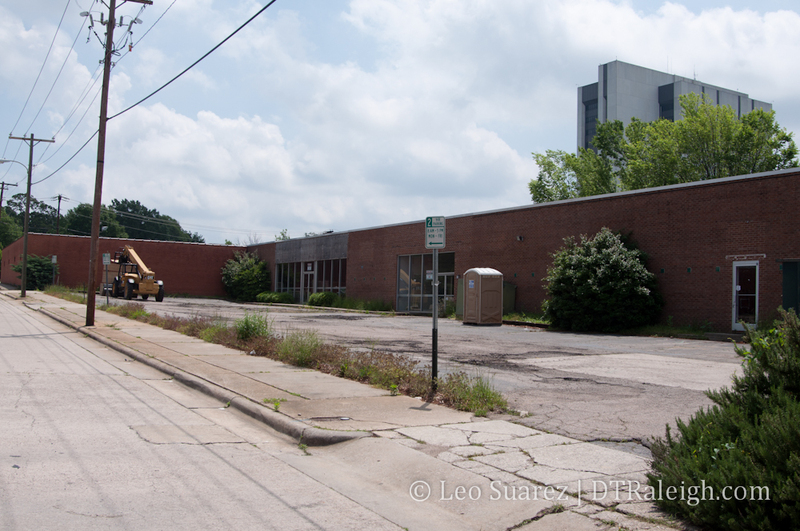 ← Previous Post Fayetteville Street Post Office Closing, Lost Service or New Opportunity? Seriously, you can’t walk 1/2 block to Halifax St. to cross Peace St.? Maybe we should just build a gondola system to make it easier for people. We just spent 9 million on Hillsborough St to make it more pedestrian friendly and I still have 2-3 people a day step out in front of my car when I am going 35mph. Use common sense people! This isn’t very hip, but I’d love to see an autoparts store–with ACE Hardware style service. As of now, I think the closest one is on Western, which is too far for a quick errand. @Jenna, I think there is one on New Bern ave. not far from downtown. Its not in the nicest part of town, but its not a bad little store. Its on the right side after all of the fast food and gas stations heading towards Wake Med. Rumor is, an Asian type restaurant with a patio will go in at least part of the ground floor space. Whatever it becomes, it’s strange the the Downtown Raleigh Alliance won’t acknowledge it. Why does the Raleigh Downtown Alliance draw the arbitrary line for “downtown” down the middle of Peace St., intentionally excluding Seaboard Station and whatever will end up going in this building? How about putting a Harris Teeter, Chipotle, and a Curves for Women.. Sounds like a good mix to me! …because there’s already a Harris Teeter in Cameron Village and a grocery store in Seaboard failed once before? ^Well, to be fair, there were tons more reasons why Capital City Grocery failed than just location alone. For one, it wasn’t a name brand that people recognized…people want a Harris Teeter or Kroger where they can use rewards cards and save money by buying store brands. That wasn’t an option there. Also, a chain grocery is better able to keep their shelves stocked with everything….unlike Capital City which ran out of basics all the time. Everytime I shopped there, I had to then drive someplace else to finish the shopping list. If Harris Teeter, Kroger or even Food Lion had been there, that’d probably not been an issue. Fair enough. I can’t see them putting a Harris Teeter there though. There’s already one just down the road. @hackles10: thanks for the info. I’ll have to check it out! Thanks for the post. I like the Seaboard area. Seem to be in Logan’s or ACE once a week. @Joe… The DRA would love to include Seaboard in the district lines, but the Seaboard owner decided against it. Those arbitrary lines are actually the borders that identify the Business Improvement District (BID) for downtown Raleigh. Properties within that BID have a special property tax that go to fund the various services provided by the DRA (ambassadors, marketing & events, economic development, etc) and when the BID lines were being re-surveyed several years ago, the Seaboard owner did not want to be included (even though most of the tenants wanted inclusion and would be the ones ultimately paying for it). Hopefully we can revisit this specific BID line once this new project is completed, as it is a different owner who has expressed a desire to have the BID services. Also, even though Seaboard and other areas bordering the BID aren’t technically in the district lines, we still consider them as part of downtown Raleigh, and I still aim to recruit businesses and development to those areas. Any idea what is happening with the Tyler’s supposedly going into Seaboard Station? I haven’t heard anything about it for months, and I don’t see any progress in terms of construction. That would be a real crowd-drawer for that area… if it ever opens. @Jeff I heard it was going in the old Tookie’s space with added space next door. I want to say the rumor was a fall opening and that they are working on the guts as we speak but I’m not sure if thats true. They are also doing a lot of work on the space/spaces in the back corner of Seaboard behind peace china. I think that shopping area needs a few more popular shops/bars to draw more consistent crowds.